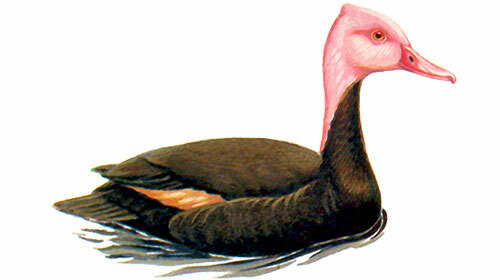 The Pink-headed Duck was a large diving duck that id now feared to be extinct. Once thriving throughout India, the swamps of Myanmar and Bangladesh the Pink-headed Duck has not been seen since the 1950’s even though numerous expeditions have taken place to locate the species. Despite the lack of sightings the Pink-headed Duck is hanging on top the status of critically endangered due to unconfirmed sightings and the hope some of the species may reside in currently inaccessible regions. The most distinct characteristic the Pink-headed Duck posses’ is, as the name suggests, a long pink head which makes any sightings of this evasive duck unmistakable. Sporting a long neck and a long bill the male Pink-headed Duck has a pink head, neck and bill inc contrast to the female of the species which has a lighter bill and a pinky/brown skin on its head and neck. The wings of the Pink-headed Duck are a mixture of brown, white and green. The Pink-headed Duck once had a fairly broad range and was thought to have been sighted most north of the Ganges in what is now considered Bihar. 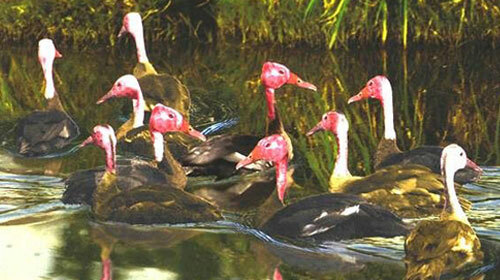 The Pink-headed Duck is also reported to have been spotted in Delhi, Nepal, Singhbum and Punjab. The preferred habitat in general for the Pink-headed Duck is thought to be a habitat of low marshes and tall grass swamp which is the perfect environment for a nest. Although sometimes observed in groups the Pink-headed Duck’s were believed to have spent most of their time in pairs even outside of breeding season. The main food source of the Pink-headed Duck was likely plants and mollusks which were readily available in these types of habitat. Some specimens of Pink-headed Duck were held in captivity both in India and England however they never succeeded in breeding and the reason for this is still unknown. 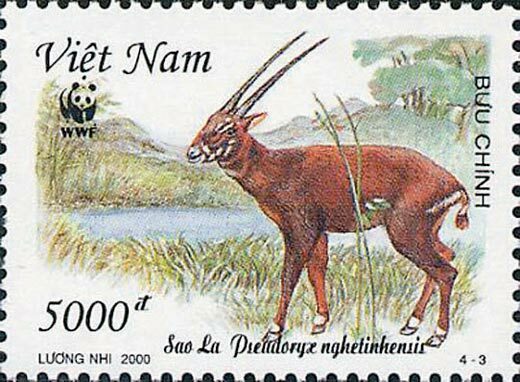 It is thought that the main contribution to the extinction (if that is the case) of the Pink-headed Duck was from habitat decimation and hunting although the Pink-headed Duck was always rare to begin with.